A wander along the track of Moorditch Lane and then around No.6 tank with a prolonged watch over No.6 tank during the hide tide period. A tightly bunched flock of c500 Black-tailed Godwit slowly spread out during the course of my watch with many scattered far and wide. A flock of c300 (mostly summer plumaged) Dunlin included a singleton merrily singing away. The partial summer plumaged Curlew Sandpiper reappeared and soon settled down to feed with the Dunlin flock. The ducks were again reduced in numbers with 17 Shoveler, 34 Gadwall, 65 Common Shelduck and barely 100 Common Teal. A female Marsh Harrier drifted in from the east and quartered the fields on No.5 tank. A heavy belt of clouds rolling in brought down a mixed hirundine flock including 3 House Martin swiftly followed by a Hobby cutting a fine figure over the sludge tank. Other birds of note included a couple of Whimbrel in the fields of Lordship Lane, numerous Whitethroat and a chatty Cetti’s Warbler. A Stoat popped up along the track for Keith on his lunch break. Observers: Jimmy Jameson, Keith Gallie (images 1 & 4-5), Sparky & WSM (images 2-3). A morning ramble from Ince to Frodsham marshes was made all the more enjoyable by spotting Springs avian delights en route. The pools at Ince were very quiet for a change with just a handful of Tufted Duck, Mallard, Common Shelduck, a pair of Gadwall and a Little Grebe to kick-start my walk. The bushes along the route were full of singing Willow Warbler, Blackcap and Chiffchaff, while both Reed and Sedge Warbler were actively adding to the cacophony in the reed beds. Out on salt marshes a Great White Egret was in the far distance along the edge by the river. 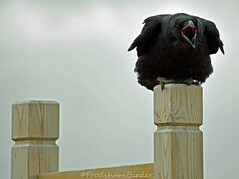 A group of Raven were doing their acrobatic tumbling in the morning breeze. No.4 tank had a pair of Whinchat which were keeping company with a Wheatear and Swallow and Sand Martin hawked the sky above. There were even more Raven congregating at the south end of No.6. A pair of Common Buzzard were sat on the fence eyeing up the young rabbits that innocently scurried back and to. A flock of c400 Black-tailed Godwit were roosting in the shallow waters of the tank and 9 Dunlin were busy foraging close by. The usual Common Teal, Mallard, Common Shelduck, Gadwall, Tufted Duck and Shoveler were again present on the water. Along Lordship Lane yet more Reed and Sedge Warbler were busy claiming and counter-claiming their territories. I bumped into Paul Crawley who had been watching a Whinchat in a stubble field and further along the lane 2 more Wheatear were spotted. A pair of Stock Dove have taken over one of the owl boxes and a Peregrine was seen over the GrowHow Works. At about the same time Ron Brumby was out watching a Whimbrel in the model aircraft flying field on Lordship Lane with another bird by the ramp track off Moorditch Lane. Images 1& 5 by Ron Brumby. The pipes on No.1 tank had 3 Wheatear, while the ‘shooters’ pools had a male Marsh Harrier (seen later heading to No.4). Brook Furlong Lane had Cetti’s Warbler calling. Lordship Marsh had 2 Wheatear and a Whinchat. No.6 had Black-tailed Godwit, a Knot, Redshank and 4 Ring Plover in a Dunlin flock of 40 (more on tank feeding). Butterflies included Orange Tip, Small Tortoiseshell and White’s. Swallow and Swift made brief appearances along with Chiffchaff and Whitethroat. Observer: Paul Crawley (images 6-11). At first light this morning, No. 6 tank held 4 Whimbrel, which soon departed, 2 Marsh Harrier and 36 Mute Swan. Also present amongst the flock of Black-tailed Godwit were a Curlew Sandpiper, 1 Knot, 1 Bar-tailed Godwit, 2 Ruff, 4 Dunlin and 3 Ringed Plover. Later, over high tide, 3 additional Knot arrived and the Dunlin increased to 52. A Swift also passed over heading north. The Weaver estuary held 5 Common Sandpiper, 1 Ringed Plover and a White Wagtail. There were 4 Wheatear, 1 Yellow Wagtail and a Ringed Plover in the flooded field on Lordship Marsh. A further 14 Wheatear were seen across the Marsh, 3 on No. 3 tank, 4 on the pipes of No.1 tank and 7 around Marsh Farm. Observer: Alyn Chambers (image 1). A late afternoon walk along Brook Furlong Lane and around the River Weaver and Manchester Ship Canal. Chiffchaff and Whitethroat were calling along the lane and a Cetti’s Warbler burst into song near the old log. Tufted Duck, Mallard, Common Shelduck and Gadwall were all on the river with a family of Mute Swan and a single Great Crested Grebe. 6 Common Sandpiper were dotted about the river and canal and a single Bar-tailed Godwit and a pair of Ringed Plover fed together with one of the sandpipers. Swallow and Sand Martin were commonplace with a lone Swift seen high above the river. Three pairs of Oystercatcher were alarm calling as I walked through their territory. A Canada goose was on the river with her young and was being stalked by a lesser Black-backed Gull. I was working this weekend so I didn’t manage to make the earlier tide but on arrival to No.6 tank there was plenty to make up for that. A smallish flock of 16 Black-tailed Godwit were swollen to c350 later with a tag on Bar-tailed Godwit, 2 Ruff and 2 Knot. The highlight without doubt was a partial summer Curlew Sandpiper sharing the feeding with 18 summer Dunlin. Common Shelduck were by far the commonest duck present with numbers of Common Teal and Shoveler well down on previous visits. Gadwall are pushing for second position at their current rise. A Marsh Harrier was over the reed beds while another drifted high from the east an hour later. A Peregrine was circling high over the Mersey estuary and was responsible for forcing a flock of godwit from their feeding grounds. The imposing cold front edging through from the north-east brought down tens of Swallow and Sand Martin to hawk insects over the open water and to rest up on the Cormorant roosting stump. Observers: Gary Worthington & WSM (images 4-7). It was an early start today as I was carrying out my first visit for the BTO Breeding Bird Survey. Before starting the survey I had a quick look over the mitigation pools on No.3 tank which held the normal residents, but I didn’t have time to stay and count them, and a nice male Whinchat that was sitting on the wires of the fence at the back of the pools. At 6:30 am and a quick retreat back to start the survey and as I stood looking over No.6 tank a Grasshopper Warbler was reeling behind me in the reeds at the edge of No.5 tank, along with several Sedge Warbler and Reed Bunting singing. Whitethroat appeared to be singing everywhere. No.6 tank was full of birds, probably due to it nearly being high tide. Peak wader counts included: 1440 Black-tailed Godwit, 4 Bar-tailed Godwit, 2 Knot, 2 Oystercatcher, 7 Whimbrel and 16 Redshank. The duck counts were: 26 Gadwall, 130 Shelduck, 35 Tufted Duck and 23 Shoveler. A Marsh Harrier also drifted over No.5 tank. The Grasshopper Warbler was still reeling as I finished the counts on No.6 and moved along to Moorditch Lane. Further out on the marshes there were 2 Jay, 5 Sedge Warbler, 12 Whitethroat, 2 Lesser Whitethroat, 6 Chiffchaff, 3 Blackcap and 4 Cetti’s Warbler. At one point I was stood a few yards away from a singing bird when another flew into a nearby bush with a bill full of nesting material. On reaching No.2 tank, an inspection of the pipes revealed 7 Wheatear and a single (released) Red-legged Partridge. A full house of hirundines were hawking over the tanks with 6 Swift, 9 Swallow, 3 House Martin and 16 Sand Martin. In total in this small recording area in less than 3 hours I recorded 66 different species, not bad for a few hours work and this does not include the hundreds of birds spread over the rest of the marsh. Observer: Paul Miller (image 1). I managed to shoe horn in a visit after work to No.6 tank and there were only c1100 Black-tailed Godwit still present from Paul’s earlier visit today. A single Bar-tailed Godwit still in winter plumage but just beginning to show a few summer scapular feathers emerging. There were also numerous Swallow and Sand Martin hawking over the open water with 10 Common Swift heading into the advancing weather front. A walk over to No.3 tank contained 25 Raven and 320 additional Black-tailed Godwit. Earlier a walk through Daresbury Firs LNR and a chance encounter with a recently fledged Tawny Owl chick (another lay dead nearby). Local walkers mentioned the birds have been present since 20th so I would assume the adult is still feeding this chick. Locals have said they are monitoring the condition of this chick and its appearances. Daresbury Firs and Tawny Owl chick. A small selection of Snake’s-head Fritillary flowers are a few locations in Runcorn this week. per Idris & Jacqui Roberts. I wrung out a few goodies from a sodding sodden rain-soaked marsh this evening with 42 Whimbrel, 1 Bar & c500 Black–tailed Godwit, 21 Redshank, 89 Common Teal, 260 Common Shelduck, 53 Gadwall, 47 Shoveler, 30 Tufted Duck and 17 Mallard. The dreary conditions at least brought in a few hundred Swallow and Sand Martin which were feeding low over the water. A Marsh Harrier dropped in at dusk while a Peregrine flew over the roosting flock of godwit and headed north. A drenched Barn Owl had the indignity of being mobbed by a Common Gull before it gave up hunting and sat it out in a bush. The rain hasn’t stopped all day but the sun finally made the briefest of appearances with a wink before it squeezed between the horizon and another rain belt moving in. Observer: WSM and image from FMBB archive. I took a walk along Moorditch Lane en route to No.6 tank where a couple of passerines drew my attention to a pile of discarded wood. The two Wheatear were busy chasing each other in and out of the wood stack before finding the manure heap more to their liking. Looking across No.6 tank into a brisk cool wind blowing in from the south-west revealed the open water full of ducks with 340 Common Shelduck being the highest number here for some time. A flock of 93 Tufted Duck was impressive even though the Shelduck stole the quack show. A selection of numerous Common Teal, Mallard and Gadwall were higher than usual. My main attention was drawn to a flock of c1300 Black-tailed Godwit busy feeding in the thigh deep water and hidden in among them was a couple of Bar-tailed Godwit before pealing off in small flocks to the estuary. A partial summer Knot and 4 Ruff were a nice diversion. Redshank numbers have dropped considerably with only 23 birds noted. A quick sprint to look across the mitigation pools on No.3 tank revealed a few more Black-tailed Godwits, Shoveler and Common Teal. A drake Wigeon with two females was an interesting partnership. A female Marsh Harrier drifted in from the Mersey estuary to join a second bird. A pair of Peregrine were like bookends on the lip of the blue topped chimney over at the Weaver estuary at Weston Point. Walking back the low heavy cloud and periods of rain brought down c200 Swallow with lesser numbers of Sand Martin. A view of the Welsh hills from Frodsham Marsh with the only splash of sunlight this evening. I even managed to relocate the up and down pivot screw that fell off my cursed Benro tripod!